Audi A4 is the sedan that combines technology and aesthetics to provide the most refined experience to the buyers. The vehicle has propelled into a new generation and has become more advanced. This time Audi A4 has received a plethora of changes that make the vehicle a much better product. The fight between the Audi A4, Mercedes-Benz C-Class, and BMW 3 Series has chronicled over the passing time. Mercedes and BMW have already updated their cars for better sales, its Audi’s turn now to bring the A4 at par with the competition. The car was launched back in April 2017 with a new diesel engine which is now more powerful and fuel efficient than the earlier one. Audi A4 On road price starts from 38,38,676/-. Check for price details of Audi A4 in CarzPrice. On the outside, Audi A4 is built on the Volkswagen’s MLB platform and is much lighter as compared to its outgoing model. In terms of dimensions as well, the new car is now longer, wider and sits on the longer wheelbase for better inner space. It now measures 4726mm in length, 1842mm in breadth, 1427mm in height and the wheelbase stands at 2820mm. The vehicle has the addition of new styling elements on the outside that provides the car with improved looks. The front features a single-frame radiator grille flanked by the angular matrix LED headlamps. The side profile gets sculpture character lines and the new 17-inch alloy wheels. At the back, Audi A4 features LED tail lamps and large body coloured bumper. Inside the Audi A4 sedan, the upholstery is a leatherette material available in two colour options and a leather wrapped steering wheel. The rear recline can fold down to increase boot volume from 480 litres to 965 litres and the Audi A4 has a dual zone air conditioning system. Interior seats of the Audi A4 are electrically adjustable including memory function for the driver seat. While the A4 Premium Plus has aluminium inserts, the A4 Technology trim has wooden inlays. The steering wheel, which is also wrapped in leather comes with steering mounted audio, phone and cruise controls. The Audi A4 is powered by a 1.4 litre petrol version that produces 147 hp of power from 5,000 rpm to 6,000 rpm and 250 Nm of torque between 1,500 rpm and 3,500 rpm. This engine is the only available option in the Audi A4 lineup and the car has a top speed of 210 kmph.Transmission of the Audi A4 sedan is a 7 speed S Tronic automatic gearbox which is coupled to 1.4 litre 40 TFSI engine. This is the only available option and the Audi A4 is not offered with a manual transmission option. The Audi A4 has a claimed fuel efficiency of 17.84 kmpl which is reasonable for its segment. The company recommends sulphur free super unleaded RON 95 fuel for best performance and mileage from the Audi A4 sedan.The standard Audi A4 mileage as per ARAI is 17.84 kmpl. The Audi drive mode select feature, start/stop button and the aerodynamic body design are aimed at getting high fuel economy, and one can rely upon a mileage of 15 to 16 kmpl in standard driving conditions. As far as ride quality is concerned, the comfort-oriented suspension deployed by the carmaker works pretty well. The demeanour of the car on roads remains serene and unruffled. The suspension which is heavily tuned for the Indian road conditions absorbs bumps and other undulation quite easily offering an impressive ride quality. Even on the broken surfaces, the cabin remains composed.The steering grip is awesome and the car takes the corner with ease. The NVH levels are quite good till the 120 kmph mark, beyond that you are likely to hear wind noise peeping in. 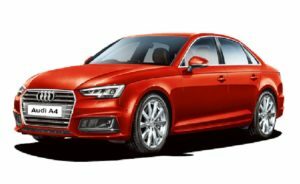 In terms of safety, the Audi A4 sedan is offered with 8 airbags, ABS (Anti lock Braking System) with EBD (Electronic Brakeforce Distribution), Audi Multimedia Interface, rear child door locks and a tyre pressure monitoring systemComing to the braking department, it’s very much predictive without any guesswork. The car can quickly shed the speed in the straight line without any fuss. In terms of safety, the car comes loaded with top-notch safety kit including 8 airbags, ABS with EBD, traction control, vehicle stability control system and hill assist. Other aspects include front and rear parking sensors, rear parking camera, warning triangle, first aid kit, tyre pressure monitoring system and anti-theft device among others. The Audi A4 has a perfect blending of high power and luxury, and has a powerful presence on the road with the latest-in-technology equipment and styling features.Audi A4 is available in two variants they are Premium Plus and Technology. Checking the pricing details, Audi A4 premium Plus petrol is tagged at Rs. 41.47 lakh while premium Plus diesel is available at the price tag of Rs. 43.37 lakh. The Technology variant is offered at the price tag of Rs. 45.05 lakh for the petrol and Rs. 46.94 lakh (ex-showroom) for the diesel one.